The meeting room will open Sep. 29th at 8:30am, for a 9am start. If you have any difficulties connecting, call the Virtual Business Meeting Assistance Line Number at 888-600-4169. After the Business meeting a ballot will be available to you via the email that you use for Toastmasters business. This email will be addresses from District 1 Toastmasters. If not readily available, we recommend that you check your SPAM email folder. On Saturday please take a few minutes to click on it and vote on the district measures. The election will close on Saturday at 10 pm with the results posted on the District 1 website Sunday. If this is your first time using ZOOM, please check the videos below prior to the meeting so that you can be on time! Your presence is needed at our Fall Business Meeting on Saturday, September 29, 2018. This meeting will be District 1’s first virtual business meeting and it is critical for you to be present and vote on five items. All Club Presidents and VPEs, District Steering Committee members, and Area Directors need to be present at the beginning of the virtual session. No proxy can be accepted on your behalf. Your attendance is of great importance in order to conduct business as we must reach the required number of officers to have a quorum. Attendance at the Business Meeting is FREE. Since it is virtual, you can attend via your computer or via phone. Below is the agenda including the five items that need to be approved by the District Council. Scheduled Call to Order: 9 am. State of District Address and reports from Steering Committee members. All of the reports are attached in Delegates Packet as required by Toastmasters International two weeks prior to the Business meeting. To make the best use of our time at this virtual meeting, we ask that you review documents early in Delegates Packet. 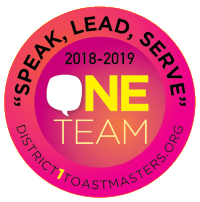 Any questions regarding the Delegates Packet, must be submitted in writing to info@district1toastmasters.org, no later than September 22. Please note: Questions not submitted in writing prior to this deadline will not be discussed at the business meeting. If you are not familiar with being a participant in a virtual meeting, we have scheduled nine online training sessions in September so all Presidents and VPE’s and other leaders can be ready to attend this business meeting virtual session. Check the District 1 Event Calendar to obtain additional information and instruction if necessary or check out the 1 minute videos from Zoom below. Video: Configuring Audio and Video. On September 29th log into www.zoom.us, then select JOIN A MEETING,then enter the meeting ID provided to you in advance of this meeting. This ID will be a 9, 10, or 11-digit number. Thank you in advance. We are excited that we will be the pioneers of this way of doing business. The entire world of Toastmasters leaders will be conducting their Fall business meetings in this format.